Railing in several styles including pre-shaped sections for upswept bow. Yardarm Footropes, bridge windshield frames, Vertical and inclined ladders, cable reels, life preservers, pulley block rigging. Radars: CXAM-1, SPS-43a, SK, SK-2, SC, SC-2, 3, 4, &5, SA, SA213, SR, SRa, SRb, SR-5, SV, SJ, and assorted radar grids for custom work. Fits Fits all 1/450 through 1/500 kits. Also equips classic Revell kits of Long Beach, Los Angeles, Pittsburgh, Boston, Canberra, Haven, and Hope as well as Monogram's Columbus and Chicago. Specific parts for Haven/Hope include helicopter deck netting, deck supports, crane boom rigging, etc. 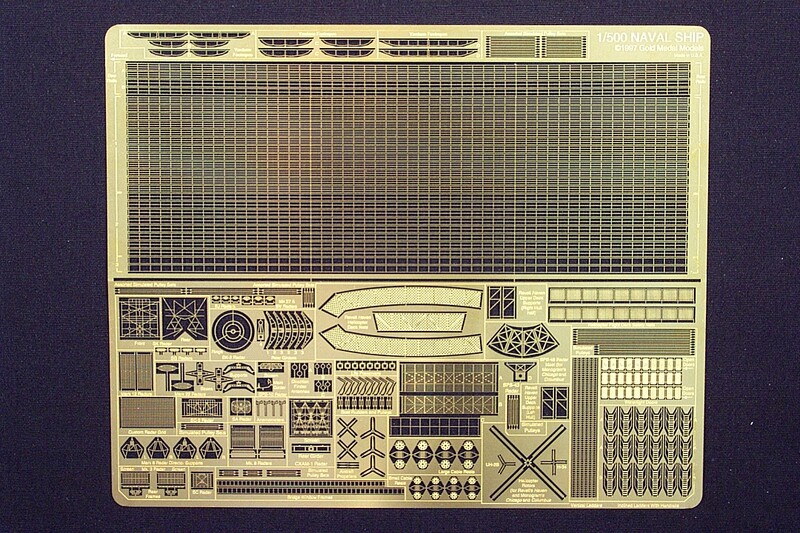 Specific parts for Monogram's Columbus and Chicago include SPS-43a radar, helicopter deck netting, etc.